Dude, voice stuff... This is quite helpful for my upcoming project. TheKritter, please stay in touch with us! And SI thanks for the links. Your welcome Draco, I will always be here for everyone's resource if you'd like a script/dialogue needed to be voiced. After a painstaking several hours of research and modelling, I present to you the complete collection of crates as seen in JP and TLW! 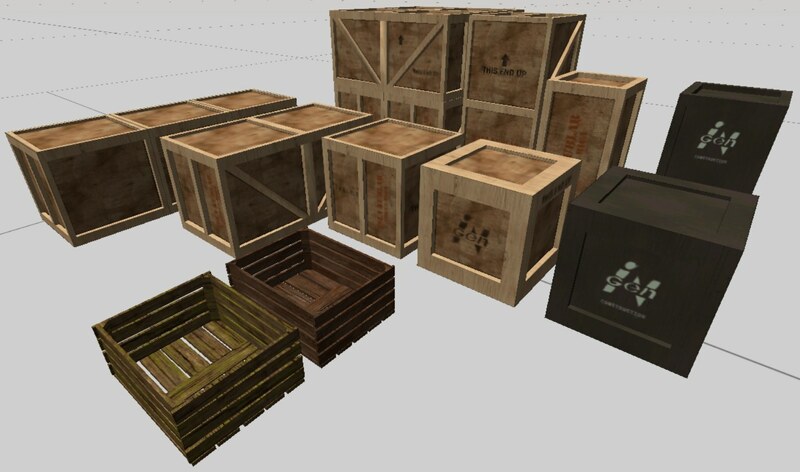 Each crate was made to look like its on-screen counterpart, and, although this image was taken hastily in TresEd, they all come with HD textures and bumpmaps to boot. These of course will replace the crates I had been using previously as placeholders - you might have already spotted some of them in the Visitor Center image I posted a while ago. They also all use modular textures for easy reskinning in future projects! The RTJP levels themselves contain both light, movable versions of each box and heavy versions which can't be moved, but can be placed strategically if needed for puzzles. The heavy versions will be denoted with a small red forklift marker, as was the case with the original Trespasser crates. Thanks! That collage I made paid off in the end, I think. Although I was looking through JP today and spotted another variant of the typical Nublar crate with an open top in the VC...which means I now have to go back and make open versions for ALL of the crates as well, since I can't make just one. At least I'm accomplishing my omnipresent goal of making plenty of versatile assets that the community can use in the future. Once Nublar is fully populated... various mods could be set on the island using the buildings already-located. Would probably want at least a couple years break after RTJP before enjoying such a return. Didn't really consider that, but yeah, that's definitely something I'd love to see, though keep in mind that the entire island is no longer populated in any single level - at the level of detail I'm work at right now, I'm thinking RTJP~Helipad alone will contain around 45000 real objects (non-TrnObjs). You'd have to either pick and choose areas to work with or delete everything but the buildings and re-do all of the foliage from scratch in order to avoid the object limit. One day we need to create some sort of Asset download section where we can put fan-made asset without the need to go into a level and grab the stuff. However, with the download section we have now, it would become to cluttery. I agree! I wish there were an easier way to access each modder's downloads without having to hunt for the appropriate forum post, sort of like the Steam Workshop. The black crates (which, by the way, are using a wood texture which I called "green", not black ) had their colour scheme ripped right from the movie - I'll have to redirect blame to the prop designers on that one . They look a lot better in game with the bumpmaps, trust me. I think it's amazing to see how Isla Nublar had become pre-2015. I'd love to visit things not shown in the movies such as the hotels with the pyramid ceilings. Perhaps even the restaurant stop that was concepted in conceptcrash's Jurassic Park Aftermath. I'd love to visit things not shown in the movies such as the hotels with the pyramid ceilings. Well, hppav already modelled those, and previous RTJP versions contained them, so I think it's safe to assume they will be present. Perhaps even the restaurant stop that was concepted in conceptcrash's Jurassic Park Aftermath. Something similar but still original will be present in the mod. Can't say where though. A hundred feet below, waves crash against the sandy, tropical shores of Isla Nublar. Up on the cliffs, it is instead the wind which assaults the forgotten road that connects the Vista View and Helipad compound with the southernmost security gate leading into the Park itself. The southernmost end of the first level - constituting about 10% of the entire area of RTJP~Helipad - is just about finished! The Vista View area itself is still WIP, but I hope to get a teaser screenshot of that area up at some point once I've finished with it. A lot of work has also been done on the northern end of RTJP, so much of what has yet to be touched is the area in-between, and the areas outside of the level which will be detailed using mock versions of buildings, low-poly models, and billboard objects. Looking good! The freshness of the assets reminds me of TC~Isle. Glad to hear it! The whole level feels distinct from the original game at this point - the only thing tying the two together is the lack of new Effects sounds (I'm starting fresh to balance out the levels a bit better, since in the previous TPA file the footstep sounds were a bit too loud and annoying) and the obvious Anne model, which will of course be replaced with Diane.